This is a small parcel of land on the boundary between Ellingham and Geldeston (see map) which was given to the then Ellingham Parish Council in around 1979. In 1986 the sum of £105 was granted by the Parish Council for the planting of trees on that site. The Parish Council has been responsible for the charity and in 1989 resolved that all Parish Councillors would be trustees for the Sand and Gravel charity throughout their terms of office. This was notified to the Charity Commissioners and the Rural Community Council. Parish Council minutes for 1991 also show that the charity was still in the care of the council. However, by 2011 the Sand and Gravel Charity become pretty much lost in the records with no mention at all in the minutes for many years. Now re-established, (after the author’s research), the Parish Council decided to pass the management of the charity to the trustees of Ellingham United Charities. The management document, called a Scheme is copied here for information. 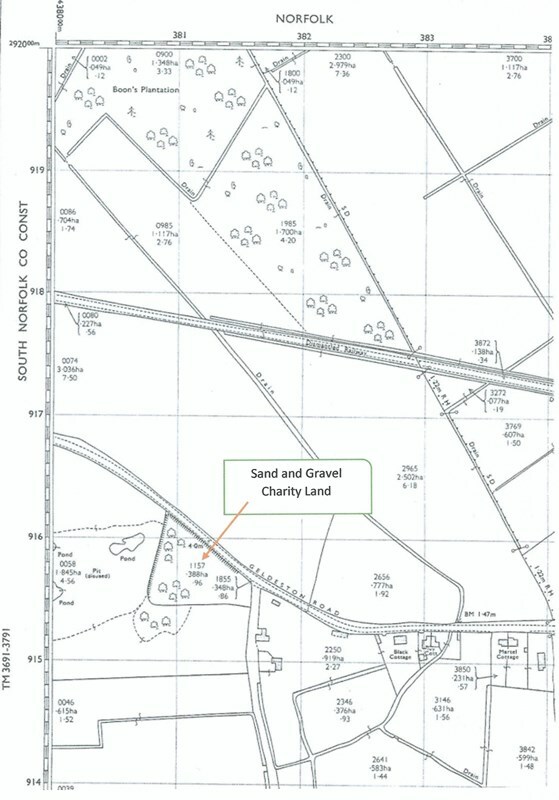 Charity – Sand and Gravel Allotment. Scheme including appointment of Trustees -and vesting in Official Custodian for Charities. In the matter of the Charity known as the Sand and Gravel Allotment, in the Parish of Ellingham, in the County of Norfolk, comprised in an inclosure award dated the 23rd April 1806 made in pursuance of the Act of Parliament of the year 1802, In the matter of the Commons Act, 1899; and In the matter of the Charities Act, 1960. • 1. Administration of Charity. – The above-mentioned Charity and the property thereof specified in the schedule hereto and all other the property (if any) of the Charity shall be administered and managed subject to and in conformity with the provisions of this Scheme by the body of Trustees hereinafter constituted. 2. Vesting. – The land specified in the said schedule is hereby vested in the Official Custodian for Charities for all the estate and interest therein belonging to or held in trust for the Charity. 3. Investment of cash. – Sums of cash at any time belonging to the Charity and not needed for immediate working purposes shall be invested in the name of the said Official Custodian unless the Charity Commissioners otherwise direct. 4. Trustees. – The body of Trustees shall consist when complete of four competent persons who shall be appointed by the Parish Council of Ellingham. Except at first, as hereinafter provided each appointment shall be made for a term of four years at a meeting convened and held according to the ordinary practice of the council. The chairman of the meeting shall cause the name of each person appointed to be notified forthwith to the trustees or their clerk. The person appointed may be but need not be a member of the council. Dorothy Stevens, of Charlton, Mill Road, Ellingham, Married Woman, for one year from the said date. 6. Declaration by Trustees. – No person shall be entitled to act as a Trustee whether on a first or on any subsequent entry into office until after signing in the minute book of the Trustees a declaration of acceptance and of willingness to act in the trusts of this Scheme. 7. Determination of trusteeship. – Any Trustee who is absent from all meetings of the Trustees during a period of one year or who is adjudged bankrupt or makes a composition or arrangement with his or her creditors or who is incapacitated from acting or who communicates in writing to the Trustees a wish to resign shall cease thereupon to be a Trustee. 8. Vacancies. – Upon the occurrence of a vacancy the Trustees shall cause a note thereof to be entered in their minute book at their next meeting and shall cause notice thereof to be given as soon as possible to the council. Any competent Trustee may be re-appointed. MEETINGS AND PROCEEDINGS OF TRUSTEES. 9. Meetings of Trustees. – The Trustees shall hold at least two ordinary meetings in each year. A special meeting may be summoned at any time by any two Trustees upon four days’ notice being given to the other Trustees of the matters to be discussed. 10. Quorum. – There shall be a quorum when three Trustees are present at any meeting. 11. Chairman and voting. – At every meeting the Trustees present shall appoint a chairman. Every matter shall be determined by the majority of votes of the Trustees present and voting on the question. In case of equality of votes the chairman shall have a casting vote whether he or she has or has not voted previously on the same question but no Trustee in any other circumstances shall give more than one vote. 12. Minutes and accounts. – A minute book and books of account shall be provided and kept by the Trustees. Statements of account in relation to the Charity shall be prepared and transmitted to the Commissioners in accordance with the provisions of the Charities Act, 1960, except if and in so far as the Charity is excepted by order or regulations. 13. General power to make regulations. – Within the limits prescribed by this Scheme the Trustees shall have full power from time to time to make regulations for the management of the Charity and for the conduct of their business including the summoning of meetings, the appointment of a clerk, the deposit of money at a proper bank and the custody of documents. 14. Letting. – The trustees shall let and otherwise manage the said land. The Trustees shall not without the sanction of the Commissioners or a competent court create any tenancy wholly or partly in consideration of a fine or for a term ending more than 22 years after it is granted or for less than the best rent obtainable. 15. Leases. – The Trustees shall provide that on the grant by them of any lease the lessee shall execute a counterpart thereof. Every lease shall contain covenants on the part of the lessee for the payment of rent and all other usual and proper covenants applicable to the property comprised therein and a proviso for re-entry on non-payment of the rent or non-performance of the covenants. 16. Sale. – Subject to the authority of any further Order or Orders of the Commissioners the Trustees may sell the whole or part of the said land and may do and execute all proper acts and assurances for carrying any such sale into effect. 17. Proceeds of sale. – Unless the Commissioners otherwise direct the Trustees shall pay over the clear proceeds of any such sale as aforesaid for investment in trust for the Charity in the name of the said Official Custodian. 18. Discharge of restrictions. – Any land let or sold as aforesaid shall be discharged during the period of the letting or upon completion of the sale from any restrictions as to the use thereof imposed by or under the abovementioned Act of the year 1802 and any other enactment relating to inclosure. 19. Expenses of management. – The Trustees shall first defray out of the income of the Charity the cost of the maintenance and upkeep of the property of the Charity and all other charges and outgoings payable in respect thereof and all the proper costs, charges and expenses of and incidental to the administration and management of the Charity. 20. Application of income. – Subject to payment of the expenses aforesaid the Trustees shall apply the income of the Charity as they think fit for any charitable purposes for the general benefit of the inhabitants of the Parish of Ellingham for which provision is not made out of rates, taxes or other public funds. 21. Appropriation of benefits. – The appropriation of the benefits of the Charity shall be made by the Trustees at meetings of their body and not separately by any individual Trustee or Trustees. 22. Trustees not to be personally interested. – No Trustee shall take or hold any interest in property belonging to the Charity otherwise than as a Trustee for the purposes thereof and no Trustee shall receive remuneration, or be interested in the supply of work or goods, at the cost of the Charity. 23. Questions under Scheme. – Any question as to the construction of this Scheme or as to the regularity or the validity of any acts done or about to be done under this Scheme shall be determined by the Commissioners upon such application made to them for the purpose as they think sufficient. Land containing 0.96 of an acre or thereabouts situate at Ellingham in the County of Norfolk having a frontage of 295 feet or thereabouts on the Geldeston Road being the land numbered 1157 on the Ordnance Survey map (1970 edition). Sealed by Order of the Commissioners this 8th day of July 1980. Land containing 0.96 of an acre or thereabouts situate at Ellingham in the County of Norfolk having a frontage of 295 feet or thereabouts on the Geldeston Road being the land numbered 1157 on the Ordnance Survey map (1970 edition). Sealed by Order of the Commissioners this 8th day of July 1980.